I have being posting a few images from my local area of late so I figured it was time to put something up of a vastly different landscape. This was taken from my recent travels, and in this case the far outback of Qld. I spent several days exploring this region of rugged ranges,spinifex and ghost gums – it reminded me a lot of the Pilbara in WA. Seemingly everywhere was a ridge or a peak that had the potential to ‘glow’ at twilight…but as a landscape photographer, not any side of the road peak would suffice. On this particular afternoon I was located at a spot I had sourced out the previous morning – a real nice composition with a ridgeline majestically ‘sawtoothing’ its way through the scene. I had watched some cloud build (without being threatening ) in the afternoon. This was a good thing as I had longed for some atmospheric help in the twilights on this trip. Constantly rechecking the bearings of the range in relation to where I estimated the sun would set and the development of the cloud, which was trying to convect on the northern extremity of the weak trough line that was running down through Qld and NSW. So the cloud was sliding SE as the troughline as a whole moved eastwards. So not making things easy to assess my options in a land of few roads. The last thing I wanted was to end up sitting on a peak with no light whatsoever. It seemed that my master plan and composition was going to ‘bust’ and be clouded out! So I made a dash north and then west to get on the otherside of the cloudbank hoping to catch some special light. Driving with my eyes on the sky and scouring the landscape for a composition I liked. A composition that not only worked but encaptulates as many of this rugged landscape’s characteristics that are special to me as possible. After several stops and running up peaks with all my gear to what I thought might be workable I finally found this spot. I had missed what I thought was the best light in the sky, but I knew the rugged rocky landscape would continue to glow and that the white trunks of the iconic ghost gums would starkly luminate in the composition. This was my last frame for the day. After the madness of relocating to this spot I decided it was where I would camp the night….down this seemingly pointless and endless rocky 4WD track in the middle of nowhere – how could I complain ? I made some dinner and then laydown to bed amongst this majestic and ancient land – content. Lying under the comfort of the great southern sky with the majestic ghost gums eeking out survival on the rocky slopes. I was not only glowing with reflection of my experiences of the day and how lucky I am to have them, but also thinking about how beautifully this location may transform in 8hrs time. It’s then that the glow of light returns to warmly kiss and caress this harsh landscape in a completely different direction. 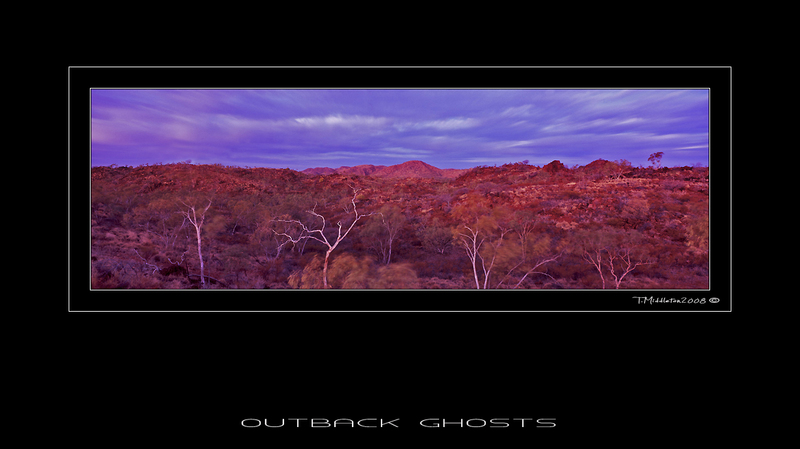 outback ghosts – Fuji G617, Velvia 50. ~ by Tony Middleton on October 13, 2008. Great story Tony, I really enjoyed it and a great photo. Would love to accompany you one day on an outback photo odyssey! This is the country I love as well, red earth, blue skies, glowing ghost gums. It doesn’t get any better! I love your outback work, will definitely order a print of you soon mate. I love the white of the ghost gum in the middle. And the glow is beautiful with the rich reds. Thank you Tom, I must admit I was a bit hesitant to how well this shot would come out as it was such a long exposure and it was quite windy…but it seems to have worked pretty well.